While it doesn't premiere until next week, SyFy has put the first nine minutes of 12 Monkeys online. Not enough to praise or condemn, but just the right amount to pique your interest. So far, the biggest departure from the 1995 Terry Gilliam film is the fact that there's no beating around the bush about Cole being from the future. Unless he's some kind of psychotic magician, it would be pretty difficult to explain away the watch and the whole vanishing right in front of Cassandra thingy. I think I prefer the prolonged ambiguity in the film. 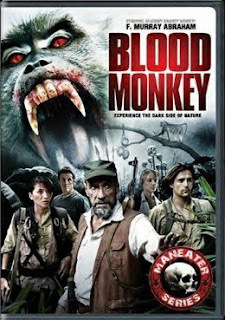 If the Sci-Fi Channel had an award show for their movies -- and they should, F. Murray Abraham would be taking home “Best Death” for his final scene in “Bloodmonkey”. After all these years, he’s still got it!